NFL Accounts Assistant Syllabus PDF 2019: Candidates who are appearing for the NFL Exam are urged to check out the NFL Accounts Assistant Exam Syllabus and Exam pattern provided below. The NFL Accounts Assistant Online Exam Syllabus and Paper Pattern will be very useful for all the candidates who are appearing for this exam. While you are checking out the exam syllabus, don’t forget to go through the NFL Accounts Assistant Exam Paper Pattern. The exam Pattern describes all the subjects that are expected for the exam and their respective marks weightage. The NFL Accounts Assistant online Exam date has not yet been revealed by the authorities. We request that you stay in touch with us as we are constantly working towards providing you with the latest news and updates regarding the NFL Accounts Assistant recruitment 2019. Don’t forget to download the exam syllabus for the NFL Accounts Assistant Online Exam. The NFL Accounts Assistant Syllabus PDF 2019 has been provided in the link provided below. The syllabus pdf will be most useful for you if you have an unreliable network connection which makes it difficult for you to log in to the internet constantly. The NFL Accounts Assistant Online Exam will be conducted throughout the country on a date which is yet to be disclosed by the authorities. The Exam will be conducted in selected venues in Jammu/Kashmir, Bathinda, Bhopal, Chandigarh, Delhi & NCR, Panipat, Lucknow, Hyderabad, Patna, and Gwalior. There will be no negative marks applicable to the NFL Accounts Assistant Online Exam 2019. Candidates are reminded that there is no interview round that will be conducted for this exam. Your selection will be based solely on your performance in the online exam. The NFL online exam will be split into 2 parts. The first part will test the candidates’ knowledge of the concerned subject for the NFL Recruitment. Furthermore, since this is a recruitment for the post of Accounts Assistant, the concerned subject in question will be commerce related topics. The second part of the exam will feature questions that are meant to test the candidates’ logical abilities, mental aptitude, and reasoning. Together part 1 and part 2 will be part of a 150 mark question paper which will have a duration of 2 hours. Candidates are requested that they check out the NFL Accounts Assistant Syllabus provided below as they prepare for the NFL online Exam 2019. Make sure that you go through all the subjects that are mentioned below. This is because there is no interview stage in the recruitment process and your selection will be determined on your performance in this exam. You can also download the official exam syllabus from the link we have provided below. Kindly ensure that you prepare very well for the NFL Accounts Assistant Online Exam 2019. 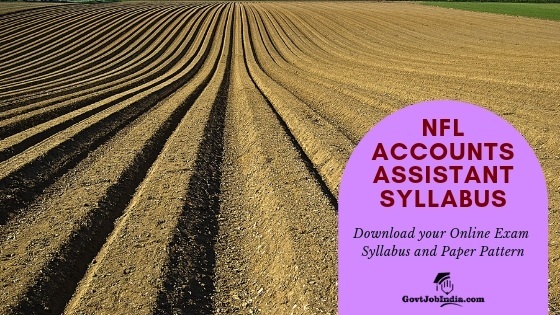 We hope that the NFL Accounts Assistant Syllabus and Paper Pattern 2019 will be most helpful for you in this matter. All the best for your exam. In case you have any doubts don’t forget to list them out in the comment section below. Please Discipline related syllabus also mentioned.